Researchers may be one step closer to understanding how antisense oligonucleotide therapies target genetic changes that cause disease. The study, led by City of Hope’s Cy Aaron Stein in Duarte, California, found that small nucleic acids including antisense oligonucleotides (ASOs) are imported into the nucleus of cells by a key molecular shuttle via a stress-induced mechanism (Castanotto et al., 2018). The shuttle, known as the stress-induced response complex (SIRC), contains key proteins involved in the silencing of microRNAs including Argonaute, TNRC6 and FUS. The findings build on previous studies, led by Johns Hopkins University’s Jiou Wang in Baltimore, Maryland, which found that FUS helps microRNAs silence genes (see March 2018 news). And, a key ALS-linked alteration in FUS leads to interference in this process, potentially contributing to the disease. The results may help researchers develop ASO therapies for ALS which can be delivered at lower doses, potentially improving tolerability and increasing efficacy. The study appeared online on June 4 in the Proceedings of the National Academy of Sciences. To find out about ASO therapies approaching the ALS clinic, check out ALS-Targeted Antisense Oligonucleotides Make Waves at AAN 2018. Castanotto D, Zhang X, Alluin J, Zhang X, Rüger J, Armstrong B, Rossi J, Riggs A, Stein CA. 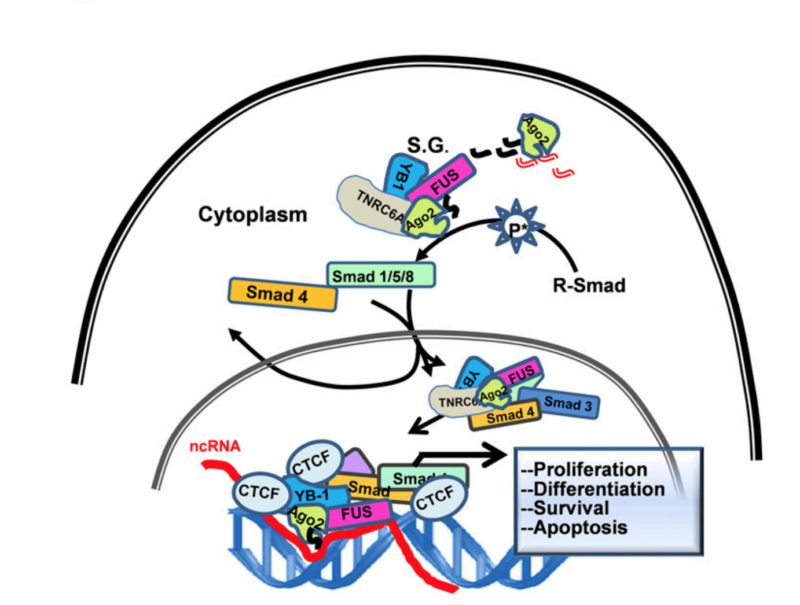 A stress-induced response complex (SIRC) shuttles miRNAs, siRNAs, and oligonucleotides to the nucleus. Proc Natl Acad Sci U S A. 2018 Jun 4. pii: 201721346. [PubMed]. Zhang T, Wu YC, Mullane P, Ji YJ, Liu H, He L, Arora A, Hwang HY, Alessi AF, Niaki AG, Periz G, Guo L, Wang H, Elkayam E, Joshua-Tor L, Myong S, Kim JK, Shorter J, Ong SE, Leung AKL, Wang J. FUS Regulates Activity of MicroRNA-Mediated Gene Silencing. Mol Cell. 2018 Mar 1;69(5):787-801.e8. [PubMed]. Wurster CD, Ludolph AC. Antisense oligonucleotides in neurological disorders. Ther Adv Neurol Disord. 2018 May 23;11:1756286418776932 [PubMed].